When we got home from the Spirit of the Land festival last weekend, Lisa saw an ad in the local paper (the Daily Advertiser) for the Batlow Apple Blossom Festival this weekend. Since we are trying to experience as much of this region as we can, and we like apples and apple blossoms, we started making plans. On Saturday morning we got up early, packed a lunch and headed off into the Snowy Mountains. Except for the gum trees, this could be a photo of northern England. The drive into the Snowy Mountains is beautiful. Batlow is a town of 1450 people about 100 km south east of Wagga, getting into the mountains. 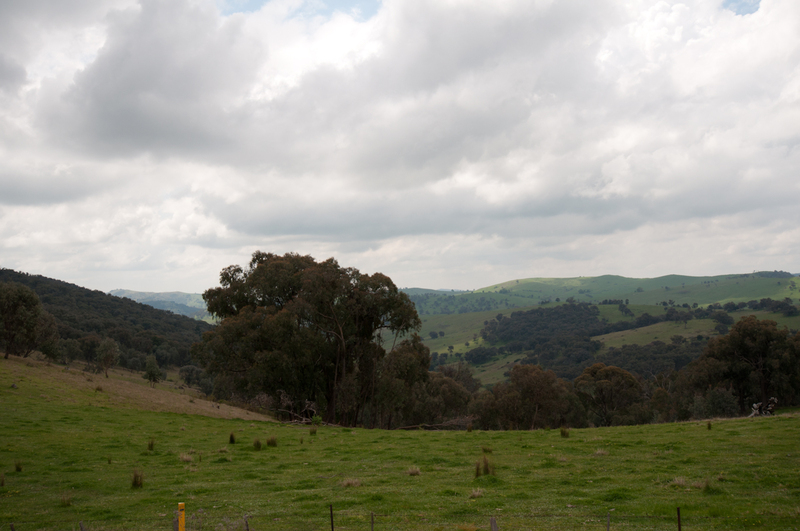 The road we took to get there went through Adelong. It is, thanks to our gps, probably the shortest way and also the most scenic way. It isn’t the fastest way or the safest probably. We were on a secondary road through Tumut Shire, and even the major roads in this area aren’t big highways. This one had a lot of signs pointing out that it was steep and winding, and it was. However, in the overall scheme of things, when you compare it to what we often drove through in Jasper or what we did in the English Lake District back in June, it wasn’t that bad. It was, in fact, very similar to the Lake District; the hills and rocks and creeks were very similar, and the fields were full of sheep. What was different is that there were, thankfully, no stone walls lining the roads. As we were driving toward Batlow, Dan was wondering what people do with all the horses we see in the paddocks. Well, we learned: at weekend, they saddle up and beat each other with rubber weapons. When we got to Batlow, we were actually a bit disappointed with the festival. It was too kid-oriented. Most of the vendors were selling toys and lucky dips (aka kids’ grab bags), and most of the activities were geared for young people. Even the photography exhibit was filled with kids’ pictures of their cats (cute! but still… a bit boring) and trips they’d taken to the zoo (did include Koala pics – but not the same as seeking them in the wild). And the worst part of our trip was that our main reason for going there – the primo event – was also targeted at kids: the pie eating contest! People we know here still talk about Dan’s bravery at entering the Ganmain pie eating contest, so we thought he could build on his legendary status by eating a Batlow apple pie; we would announce that he had done it by sending out an invitation to watch him in a third contest later this year at the Young National Cherry Festival. But this one was a bit of a bust. Contestants were given an individual size pie covered in whip cream (the spray can kind) and they had to eat it with hands behind their backs. So it was really just a humiliation game – there wasn’t even an official timer – and the only entrants were kids. So Dan didn’t bother. Oh well, there’s still Young coming up (and that one promises to be messy…what does one wear to a cherry pie eating contest?). 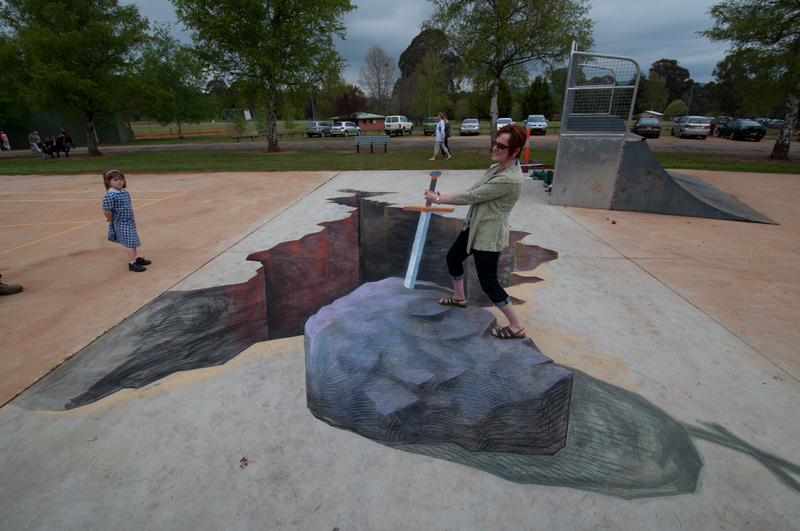 OK, so 3D chalk art is a bit cheesy, but they say that apple pie and cheese go together. Aside from a few craft/food stalls (yes, sausages wrapped in white bread are available everywhere – ick! ), the other highlights of the day were a jousting display (the festival had a strong medieval theme going, for some reason) and an urban chalk artist. Unfortunately, this guy was off in a corner of the festival grounds (just past the apple sling-shot event – again, geared at kids) so he didn’t get too many visitors. A real shame, since his chalk art was absolutely fantastic. He was just putting the finishing touches on a Sword in the Stone 3D image, so he invited us to take a photo with his masterpiece. Once Lisa climbed “up” on the rock to try to pull the sword from the stone, a small crowd gathered. Could she do it? Nope! An older gentleman then gave it a try; still no luck! It turns out that there is an annual Chalk Art Festival here, too (this year it was held in Parramatta, mid-October). We may just put that on our to-travel-to list for next year. The L-shaped one in the middle is a hunting boomerang. First, they roust out the roos with the 'normal' boomerang, then throw this at its legs to trip it. Then you hit it with the bonking stick that is two tools to the left of it. Roos are pretty big...doesn't seem like that bonko would do a lot of damage. The most entertaining thing at the festival was that we had a long chat with an indigenous woman (maybe Wiradjuri, not sure though) who works for the local parks service. 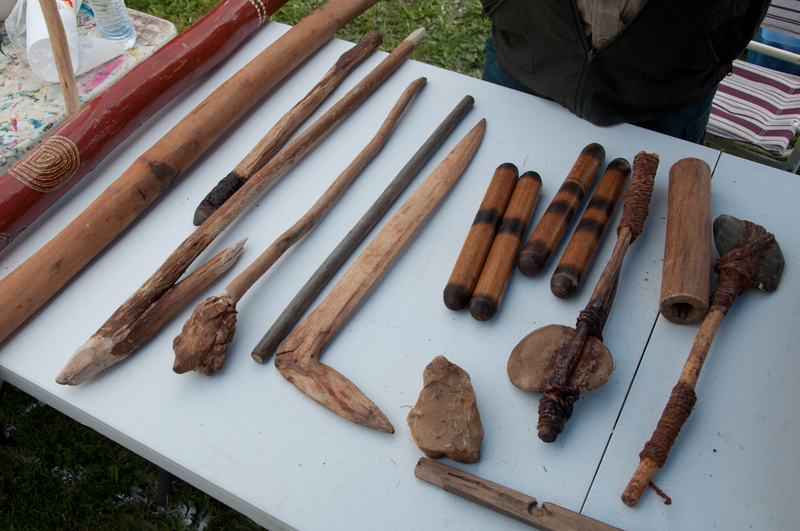 She was there with a display of traditional tools that she takes around to schools to teach kids about Aboriginal culture. Given that we know absolutely nothing about it, what she told us was very informative. She told us, for example, that there are different types of boomerangs and discussed how each was used. She had on the display table some different bowl-like vessels made of bark, and she explained how they were created. She showed us an emu call. And she had a didgeridoo, of course. That was interesting because she said that as a woman, she was allowed to handle it but not to play it. She could hand it to Dan, and even though he is white he would be allowed to play it because he is male. But she can’t play it, even though it is from her tribe. The streets of Batlow are littered with apple-picking boxes. 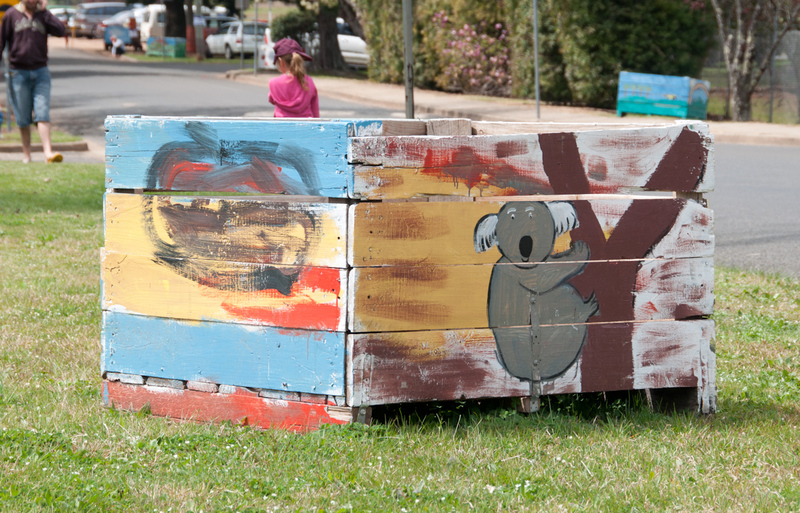 We're not sure if they were just there for the festival, or they are there permanently for people to store their koalas in. We did buy some apples at the festival. They grow good apples in Batlow! It gets cold enough to make them crisp, unlike the BC apples that we have been eating in Alberta for the past decade that were never really satisfying. Lisa still thinks nothing can beat a mac from Meaford… or maybe Thornbury, but considering we are in a climate more suited to citrus, the Batlow apples are more than acceptable. And we bought an apple cookbook published by Batlow apple producers that has some really interesting recipes, both sweet and savoury. It will be fun trying some of them. And, on the way out of town, we stopped at a little bakery/cafe and lucked upon the last two pies – the same ones they were eating in the contest. So Lisa gets to try one, and Dan gets to have his without the humiliation of smearing crappy synthetic whipped cream all over his face. 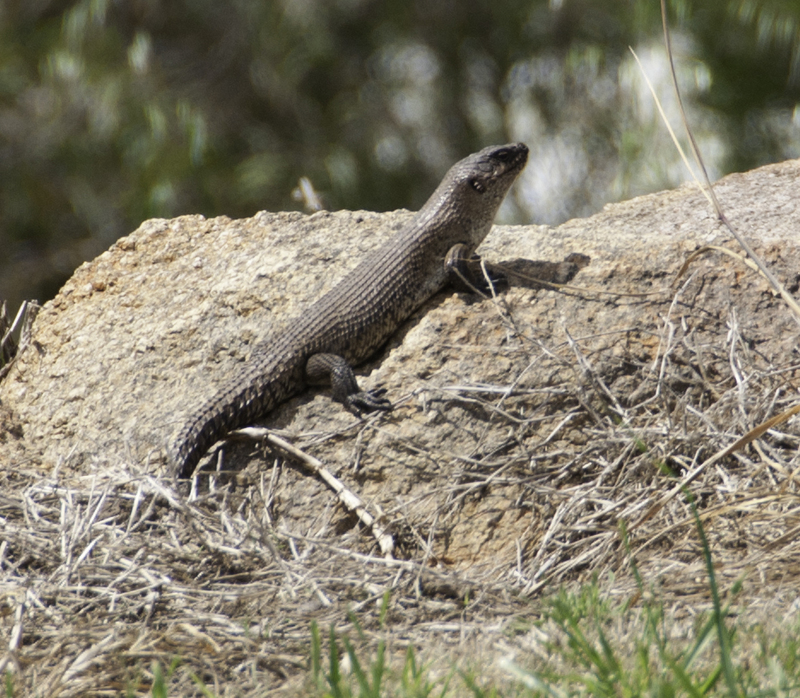 This black rock skink was sunning himself in the picnic area at Adelong mine. He's about 18 inches long, which seems pretty big from a Canadian perspective but he's only about 1/4 the size of the monitor lizard Dan saw earlier in the week. What a cool place to live! On the way home, we stopped at a historical site on the edge of Adelong. It is the site of an old gold mine, that is in ruins now. Sadly, the site was damaged in last year’s flood and the walking paths are still closed to the public. Happily, today’s paper mentioned that they have received funding to fix them up; the trails may be open in December, and we’ll definitely be back! The other good news from this side-jaunt was that Lisa did some awesome lizard spotting… well, actually, a skink. He was sunning himself on a rock just below the ruins viewing platform. Another cool animal to add to our growing list. We’re still on the hunt for a blue-tongued lizard (so far, the closest we can get to finding one is on a beer label). 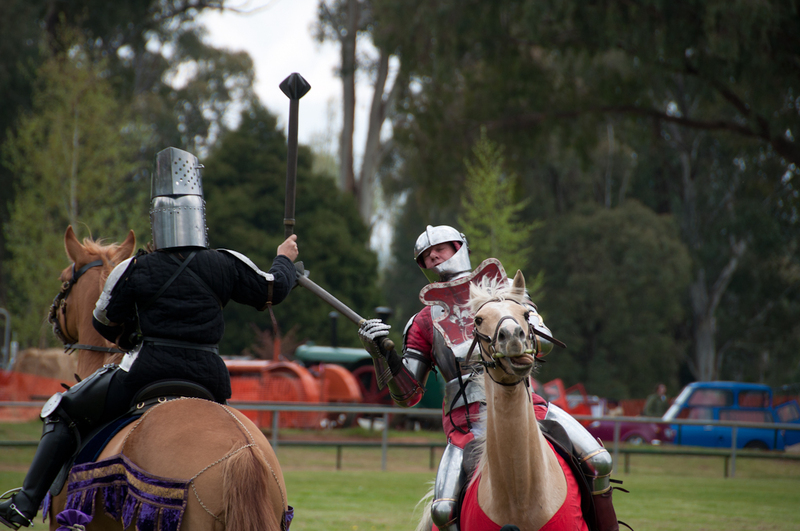 This entry was posted in agriculture, apples, Australia, Batlow, bogans, driving, fall fairs, farmers market, festivals, food, horses, koalas, lizard, market, mountains, pie, Riverina, road signs, rural life, shows, skink, small town culture, Snowy Mountains, traffic signs, wildlife and tagged jousting. Bookmark the permalink. The best part of the picture with Lisa and the sword is the little girl to the left staring at her with her face all screwed up and clear wondering what the hell Lisa is doing. Yes, when we looked at the photo we thought of captioning it with something about Lisa then went on to decapitate the child with the sword. BTW, that photo was taken with my wide angle 10-24 lens, on 10, so probably the best shot anyone got all day.